Naomi is definitely one to watch, currently working in a Learning and Development role for fashion brands such as Tommy Hilfiger and Calvin Klein she’s also a proud mother to two young boys. 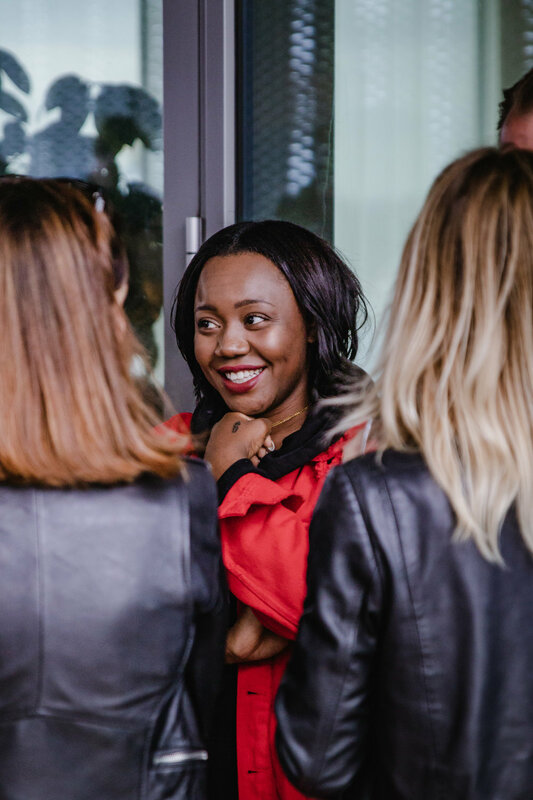 We chatted to Naomi and discussed the importance of her role within businesses, the value of people and great communication skills and what she’s learned since becoming a mother. We also got the lowdown on her recent mentoring experience with the charity You Make It and how she’s taken her own life experiences to help empower other young women. Tell us a bit about what you do! I am a Learning and Development Officer for PVH UK+. For those who may not know, that is the umbrella company for Tommy Hilfiger and Calvin Klein. Many people confuse Learning and Development for training. There are definitely elements of training involved, however L&D actually encompasses the full cycle of behavioural development varying from soft skills, relationship awareness, emotional intelligence, personal development and working with psychometrics. Prior to running development sessions, workshops or programmes, there is a vast amount of analysing and strategising required to decipher what the learning focus should be. This is followed by design, then implementation. Post-implementation we then evaluate and measure the impact. When deciding what programmes to consider it is key for me to have a presence within retail. Not only to enable an objective outlook, but also to understand our colleagues, and most importantly so they get what they actually need, rather than what we assume they may need. Being a L&D officer in such a vast organisation requires an agile, strategic, responsive, tenacious but most importantly an enthusiastic, youthful but professional approach. L&D really focuses on behavioural growth, rather learning a new skillset you’re raising personal awareness to support each and every colleague’s optimal effectiveness for the benefit of the individual, not the business. How did you get into this role and what was the journey like to where you are now? That is actually a funny story but here is the short (shortest I could make it – hides face) version. My retail journey began at 16 in House of Fraser as a part-time Christmas temp. I quite quickly saw myself in my first management role at 17. I had no real idea as to what I wanted my long-term career to be but I did know I was highly driven by achieving results. By 18…still in management, I naturally thrived on developing people, however at the time I saw this as an individual part of my role and not as a career option in its own right. Time went on and I had what I would refer to as a pit stop in Image Consultancy. I would say I found out a lot about myself through this period which was ultimately how much I truly enjoyed dialogue with people about what they want to achieve and figuring out all the routes of how to get there. I also met some amazing creative people from the fashion industry, make-up artists, photographers, stylists and hair stylists. One of these creatives took me under her wing and I began assisting her in styling and working in a boutique on Dover Street which offered personal shopping to A-List celebrities. In November 2015 I joined a reputable luxury shoe company in the head office. From the day I entered I knew what I wanted to achieve and pretty much nothing was going to stop me. I spent all the hours under the sun doing the role I was hired for but also building collateral for the wider team to support their productivity, efficiency and overall employee experience. At this moment I realised that my true driver has been the time I spent with people for no personal return but to truly support them at being the best version of themselves. My manager throughout this time was my biggest support system who actively supported the idea of creating a dedicated role for training within the department. Silly old me thought this would be handed to me on a plate. NO! Now as I’ve stated before, I knew I enjoyed developing and supporting people but the training side of things for me began to stagnate. I wanted to take people on a journey, offer experiential learning and not just on how to use a specific system etc., but as I had very little knowledge of L&D, finding a path to get there wasn’t clear. I guess this is where you can say my life had a plot twist. I began soft job searching with an unclear aim, I interviewed for a HR Coordinator role at PVH to which my now manager interviewed me for the first time around March 2017. After my first interview, he decided that role was not for me but wanted me to join his team in Talent and Development. I was invited for a second interview for an L&D Officer role in Aug 2017 – my-oh-my it was like no interview I had ever experienced before but I was convinced I wanted the job. After a third gruelling interview I was convinced I’d failed – I will never forget the HR Director putting down my presentation and saying quite simply ‘I do not get it! So what?’. At that point, all prep went out the window and it was just me, face-to-face with my career, fighting for what I knew I wanted. In November 2017 I got a call…and that was where it all truly started. Why is Learning and Development so important to organisations such as PVH? What has working in the fashion industry been like? Retail Fashion is a crazy business – there is no such thing as a slow day. Your finger has to remain permanently on the pulse. Staying in tune with the industry is essential; trends, competitors, reports – some things which may have worked yesterday but may not be right for the next day. Many think it is an easy sector but easy is far from the true experience. For me it has been trying at times, but when it works for you, it can be the most rewarding industry ever. Do you have any advice for anybody trying to break into fashion? I would always encourage anyone, from any walk of life to never lose yourself. Your greatest gift is your mind (and your creativity) so never shut it off. What is your biggest career learning so far? I live by these learnings daily. Everyone has their own way, you may not always agree, but appreciating that there are many routes to get to one result is powerful. At the time, you may feel like you are losing, or you may feel like you are gaining but neither are here nor there – the main thing is that you are on route. How do you juggle being a mum and having a career? “Yes, two beautiful boys Cairo-Jesse (8) and Roman-Jacob (4) They are my pride and joy, and everything I do is for them. Being completely honest though, I would not be able to do anything without my cousin, who also is my nanny. One of the key things I have identified which keeps me going is that I have identified my WHY. There is an amazing video from a speaker Simon Sinek and he talks about the idea of The Golden Circle. And I have identified why I do what I do – to set a solid foundation for my boys, role modeling the behaviour they need to achieve all they want in life. And the ‘what’ is just the bi-product. You are a mentor for You Make It. Why did you decide to donate your time? My life has been one of ups and downs, affiliating with the wrong crowds, living a turbulent life when I didn’t have to. I was raped at the age of 14 and found myself in physically and emotionally abusive relationships. I sought fulfilment in all the wrong places and fell pregnant at 18. Through all of this, I never had a solid person in my life who had an objective approach to my reality – a sounding board. Not someone who had all the answers but someone who’s sole objective was to support me in looking at life through a different lens. I went through life not really understanding why I’d experienced all that I had and what I could do about it. I ended up meeting Asma Shah during an L&D event for International Women’s Day and she spoke about her life and her story and told us all about the amazing charity she set up, You Make It. I instantly knew I had to be part of it despite my inner pessimist telling me I couldn’t do it. Although I do not count my input to my mentee’s life as the most significant, but knowing I am supporting someone in the way they need is the most fulfilment I need. Silence is a killer, I learnt that the hard way. 70% of our learning and development is through our day-to-day so to be able to be a positive part of someone’s life and to help them to see life through a different lens even for a short time is an indescribable feeling. I am inspired by being the best version of myself. The beauty of this concept is that it has no ending and I find that really inspiring. I spend a lot of time listening to one podcast in particular – Oprah Winfrey Supersoul Conversations and reading a blog THE BOOK OF LIFE. Music is my world, music can fulfil me and answer questions I am lost in. Mainly soul music but my biggest inspiration is spoken word. Spoken word is such a mindful, soul provoking art. A thousand stories can be told in a few lines. What is your favourite quote to live/work by?